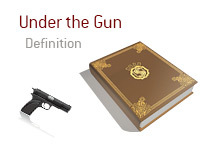 What does the term "under the gun" mean as it applies to the world of poker? What is the definition of the term "under the gun"? In poker, "under the gun" (or UTG) refers to the player who is first to act in the pre-flop betting round. This is the player who is seated to the immediate left of the two blinds (small blind and big blind). After the flop, the "under the gun" player will be third to act (presuming that the two blinds didn't fold). The small blind will act first, followed by the big blind, who will then be followed by the "under the gun" player. The player who is "under the gun" is at a big disadvantage due to their position. As mentioned, the UTG player is first to act in the first round of betting, which means that every single one of the other players at the table will act after them. Let's say that you are under the gun and are dealt pocket Sixes. Now, given your position, a hand like pocket Sixes is pretty tough to play. Do you raise? If so, what do you do if a player in late position re-raises you? Do you just call? What happens if a player in late position raises you? Or, let's say that the other players at the table have correctly come to the conclusion that you are a tight, passive player. If you are UTG and raise, the other players at the table will almost certainly believe that you have a monster such as AA or KK. Unless they also have a very strong holding, they are almost certain to fold their hands. UTG+1 refers to the player who is to the immediate left of the UTG player, while UTG+2 refers to the player who is two seats to the left of the UTG player.